Compassion is an indispensable part of nursing and patient care. Nurses should feel compelled to exhibit compassion towards patients; its absence can lead to patients feeling devalued and emotionally precarious. How Can a Nurse Demonstrate Compassionate Care? Even the smallest of responses can convey compassion — greeting patients with a smile or simply making eye contact. Each positive gesture further solidifies the commitment to providing patient-centered quality care aimed at improving patient outcomes. Leo Buscaglia observed, “Too often we underestimate the power of a touch, a smile, a kind word, a listening ear, an honest compliment, or the smallest act of caring, all of which have the potential to turn a life around.” From sharing real-life anecdotes with patients to respecting patients’ choices, there are a multitude of ways to be sensitive to patient needs and show compassion. 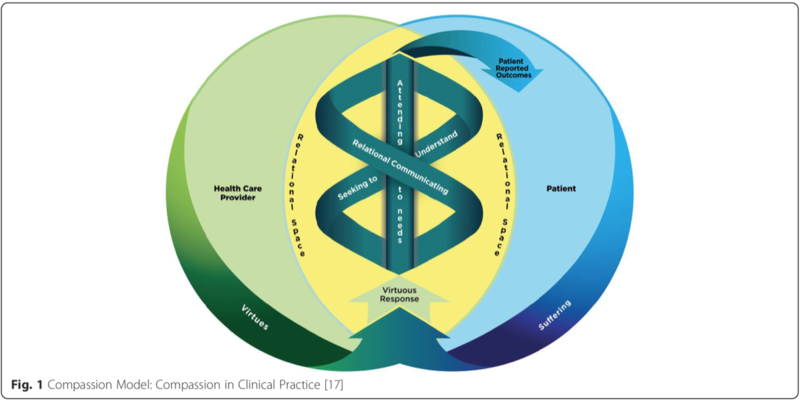 This clinical model of compassion from BMC Medical Education illustrates the health care provider’s role in relation to patient care and compassion. 1. Emotional intelligence. Strive for high emotional intelligence to handle interpersonal relationships with coworkers and patients. Awareness and mastery of your emotions and others’ emotions will help you provide compassionate care. 2. Resilience. Maintain personal resilience through participation in reflective activities to explore personal values and others’ perspectives. An article published by the American Journal of Critical Care shows that participating in these types of self-exploration activities can improve a nurse’s resilience which is “associated with increased hope and reduced stress.” With increased resilience and reduced stress, nurses are ready to provide quality and compassionate patient care. 3. Critical thinking. Demonstrate the ability to think critically and solve problems quickly to achieve high-yielding results in patient satisfaction and care. Nurses who can find solutions deliver compassionate care effectively to patients and families. 4. Cultural awareness. Maintain cultural awareness as it relates to patient-centered care. Culture can influence a patient’s view of treatment, overall health, and death. Knowing the patient well enough to determine their cultural view can augment the nurse-patient relationship in a positive way. 5. Confidence. A nurse with the ability to communicate any instances of abatement in quality of patient care is critical to fostering the culture of the caring environment within the healthcare organization. Nurses must be able to discuss issues and indicate a clear vision of how compassionate organizations should function with both peers and leaders. Why is Compassionate Care in Nursing Important to Patient Outcomes? 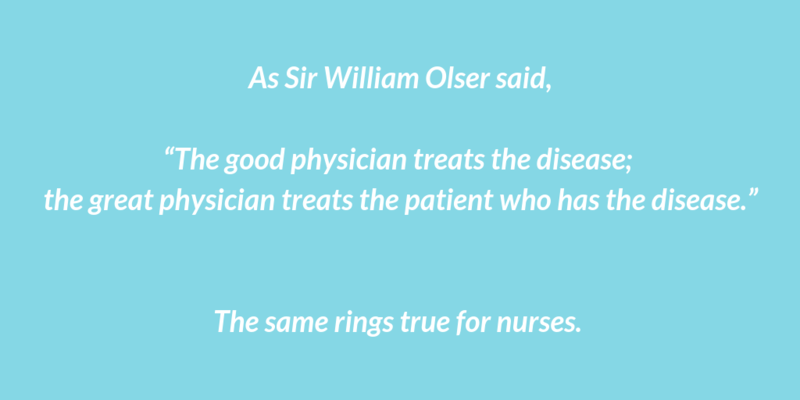 Complete patient care goes beyond caring for the patient’s physical problems. Patients may experience additional stress related to their financial situation, familial relationships, and even their physical environment. It is paramount for nurses to treat not only the illness or injury, but also to effectively address the patient’s emotional state. Showing respect for the patient by providing transparency and reassurance can positively impact patient recovery time and satisfaction. Showing compassion can make a world of difference in someone’s day. Being mindful of others allows you to be a driver of change by acting with intention and compassion. Nurses have the opportunity to focus on empathy, ensuring that the patient feels valued, respected, and comfortable with their care.Empathetic and compassionate care are associated with greater patient satisfaction. Kirby Bates’ goal is to support our partners in building exceptional healthcare leadership teams: Teams that take the lead in ensuring safe, high-quality patient care and are committed to positive patient and family experiences. As former hospital CNOs and COOs, we know firsthand the challenges facing healthcare leadership today and have a proven track record. With 30 years of exceptional leadership solutions: Executive Search, Interim Leadership, Coaching, and Consulting Practice, we provide sustainable outcomes and maximum return on investment. Celebrating our fifth year as Sponsors of the DAISY Foundation, Kirby Bates shares the commitment to skillful and compassionate nursing care. Please share your thoughts or experiences on this topic by leaving a comment below. For more information or additional questions, contact the Kirby Bates Associates team of experts today. Next Next post: Congratulations to Robyn Begley, DNP, RN!